I am so happy that my friend, DeAnna, recommended this book, and I am very happy that I read it. I love just love reading books about countries foreign to me, by a person who is non-native to that country - I just love this perspective - sort of a Stranger in a Strange Land perspective. I always enjoy this viewpoint. 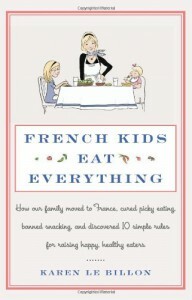 I was stunned and amazed to learn about the French Way of Eating, positively stunned. I was stunned and shocked at the treatment which the author received upon offering a taste of a strawberry - seriously? People are offended by the offer of A STRAWBERRY? It just seemed so very rude and so very rigid. I feel so old when crap like this bugs me, heh. And I got to feel old quite a lot while reading this book, since she referred to food as "healthy" about 7 billion zillion times. Speaking of repetitious, it seems as though she was contracted to write 300 pages long, but could only come up with 60, so she was now faced with the problem of having to say everything 5 times, because she pretty much SAID EVERYTHING AT LEAST FIVE TIMES. Also, Oh My God what a twit! Do young mothers these days, honestly, call their hostess to see what is on the menu so as to suggest alternatives for their picky children? Seriously? And she's shocked that her family finds this behavior rude? It's not rude, it's reprehensible! I can't imagine EVER doing such a thing. I just can't. Seriously, people do this? The mind, it boggles. Do young mothers these days, honestly, give their kids snacks all day long and then wonder why their kids won't eat their supper? Are people, honestly, this dim? What happened? Once upon a time, people were able to figure this out all by themselves. She needed her mother in law to point it out? Once again, I was stunned. So, the book was fascinating to me, as a life-long-poorly-traveled American, to have a glimpse into the eating habits and behaviors of the French. It was also pretty eye-opening to learn the eating habits and behaviors of modern young Americans/Canadians because I had no earthly idea that this was going on. No wonder the whole country is obese. It's sobering.